Bullerwell Independent Insurance Brokers were established in 1982 by Ian Bullerwell, an ex-international rugby union referee and a Life President at Bedford Blues Rugby Club, who continues to take an active role in the company today. We pride ourselves on being approachable, helpful and giving a personalised service to all of our clients and are delighted to provide knowledge and support to them whether that be planned or in an emergency. In an era of outsourcing and call centres we strongly believe that the personal touch gives us the edge over our peers in the Insurance Industry. In 2016 we secured Lloyds Coverholder status, which is only granted to a limited number of brokers & underwriters in the world. 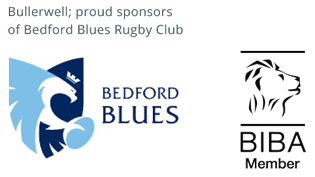 We are also proud sponsors of Bedford Blues Rugby Club and continuing the rugby theme are proud to have in our ranks ex. Leicester Tigers, World Cup Winning, England & British Lions player, Neil Back MBE. Whilst being truly independent, Bullerwell are part of the Ataraxia Broking Ltd network of brokers. Ataraxia’s members place over £120,000,000 of premium income, providing us a seat at the top table of the major insurance companies in the UK. This gives us the ability not only to be independent but also secure deals many other brokers are not able to access. Bullerwells are members of the British Insurance Brokers Associated (BIBA) and are regulated by the FCA.